Built by Edward Ribenack and his brothers Henry and Albert, the yellow brick Lenox Hotel originally stood four stories tall and offered 110 rooms. 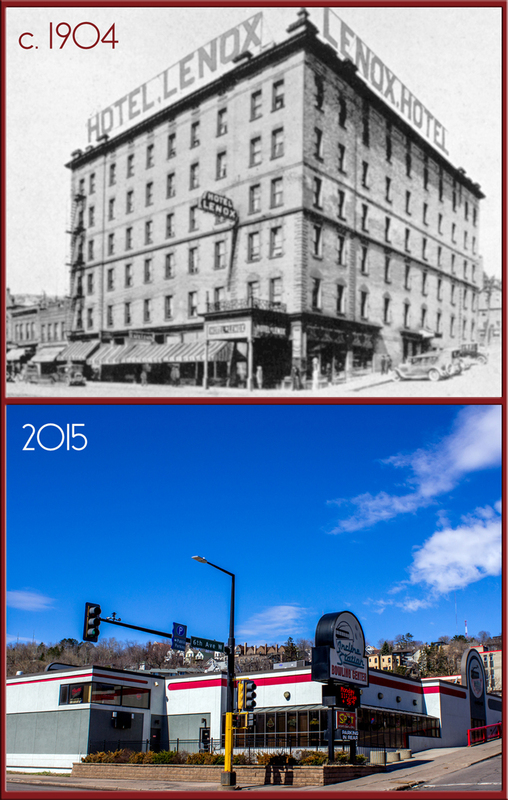 Within two years the Ribenack’s added two more stories, increasing capacity to 205 rooms. Like the Spalding, it had a separate “Ladies Entrance” along the avenue. In the 1930s a remodeling effort created the popular Lenox Bar and Grill, which included a cocktail lounge that could hold 190 customers. Edward, who ran the hotel until 1947, also enjoyed a long career in the Minnesota State Legislature, serving in both the House and Senate. Despite the big new lounge, the Lenox struggled. It changed hands several times, finally becoming part of the Midwestern Hotels chain. By 1958 the management struggled financially; at one point its electricity was cut and workers’ salaries withheld. The Lenox managed to stay open until 1961 when its sixty-five tenants vacated prior to its demolition as part of the Gateway Urban Renewal Project. The Incline Station Bowling Center stands in its place.